You’ve heard about the importance of healthy bones for years now. So, you supplement with calcium, and more recently vitamin D. Bone health awareness is now considered the norm among aging baby boomers. Then, as you creep up in age a little further, you begin to fear falling. Many elderly people report that the fear can become so great, it can be more debilitating than a fall itself. And yet, you probably never thought about the health of your muscles. Even though those muscles can dramatically influence both your bones and your balance and ability to stay upright. So why doesn’t your muscle health get nearly as much press? And while sarcopenia may still be the neglected stepsister of osteoporosis (the thinning of bone tissue and loss of bone density over time), more information is emerging about how to fight it. 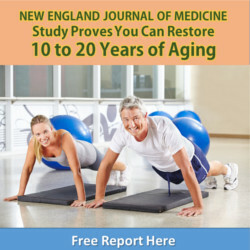 In this issue, I’ll help you uncover some approaches to diet, exercise and supplements you can use to build and protect your muscles as you age. And perhaps the most important approach of all… I’ll help you change the way you think about your muscles… and help you discard the assumption that your muscles will waste away with age no matter what you do. It’s usually found in people who are physically inactive throughout their lives (but not always.) And it strikes at different ages with varying levels of severity. But while age and activity level may be two factors, there are other influences as well. Like most other conditions we face as we age, such as osteoporosis and arthritis, it is a combination of our genetic predisposition and the lifestyle choices we make that add up to our ultimate health. Which means there is something you can do to prevent muscle loss. 1) Exercise: Despite the fact baby boomers have spent more time at the gym than perhaps any other generation before them, they are still not safe from sarcopenia. Recent research suggests it’s because strength or resistance training in particular builds and protects muscles in ways aerobics, stretching, and other forms of exercise don’t. But aerobic exercise may help aging skeletal muscle by improving the bioenergetics of your mitochondria – and it also decreases insulin resistance – so don’t abandon it completely. My new recommendation is to add two 30-minute sessions a week of resistance or strength training using weights, bands or air pressure machines like you would find in a gym. Plus, continue with 30 minutes a day of walking, biking or swimming for aerobic health. Be sure to alternate a steady pace with occasional bursts – so that the caveperson in you is always ready to run from the Saber tooth tiger! 2) Diet: While the American diet is heavy on calories, and arguably is too high in protein, research shows that as we age, how much we absorb is compromised – and it shows in our muscles. Empty calories and not enough protein starve muscles of what they need to stay healthy. Also, most of us have an imbalance between omega-6 and omega-3, which creates an acidic environment in the body. Acidosis causes muscles to contract, and for the protein stored in the muscles to break down. Following my Modified Mediterranean Diet will keep you on the alkaline side of the PH equation. And also, be sure you are taking probiotics so you are absorbing the protein and nutrients in your food more completely. 3) Hormones: The decline of hormones in just about every area of the body is one of the biggest challenges of aging. For your muscles, loss of Growth Hormone (GH), DHEA, and testosterone (yes, even for women) packs the biggest punch for both muscle and bone. Any hormone replacement therapy should be preceded by testing for levels first. That said, I find many patients do well by supplementing with 50 to 100 mg. of DHEA daily. After a simple blood test for the stored form of DHEA (known as DHEA-S), it’s usually both safe and effective to begin taking DHEA 50 mgm./day if you’re a man, and 10-25 mgm./day if you’re a woman. Some women may see extra hair growth on their chin or face after a few weeks or months. If this happens, switching to the 7 Keto-DHEA metabolite capsules will stop this. I remember when a friend, who was in his mid-forties at the time, told me he only wanted to live to be 72. After that, he reasoned, it’s all downhill. He didn’t want to be around for much more physical decline. Then, he stepped out to smoke a cigarette. There was simply no convincing him that anything more was possible for him. He’d made up his mind. If you’re going to combat conditions such as sarcopenia and osteoporosis – or any of the many conditions that afflict us when we age – you first need to change your mind about them, and about your health in general. You have to be able to make the mental connection between years of diet choices and visits to the gym, and the long-term health of your muscles and bones. If you think about it, our fear of aging is mostly a fear of frailty. Of being weak. Of losing our mobility. Of being prone to injury. Of losing our independence. This current generation of baby boomers is the first in recent history to think of aging as more optional than inevitable. But in a culture where we are trained to swallow a pill and expect a result, it can be an enormous leap of faith to trust that you can have a different experience of aging than your parents and their parents had. And yet, that’s exactly the leap you need to make. Sarcopenia can sneak up on you. You might only lose 1% of muscle mass a year, starting at age 40. By the time you get a diagnosis of sarcopenia, you may have lost 20%, 30%, 40% or more of your muscles. The bottom line is, it doesn’t matter where you are on that slippery slope. What matters is that you decide you can make a difference, and start implementing the diet, nutrition and exercise choices that make a difference – starting today. Decide that frailty is not your future. And then make choices that support your decision. Health isn’t necessarily all in your mind. But it certainly starts there. Decide to preserve your muscles today, and see how much your definition of aging changes in the years ahead. Choose to live strong.